Happy happy Saturday loves! I'm so freaking glad the week is finally over and that I can enjoy a full two day weekend. Ah, the little things in life. I was so fraught yesterday that I left my brand new handbag at the yogurt shop and didn't realize it for three full hours. When I did, I totally freaked and had to retrace my steps. Luckily the owner of the shop was sitting next to us while we were there and realized it was my bag after we left. Oy vey. My brain must be addled. 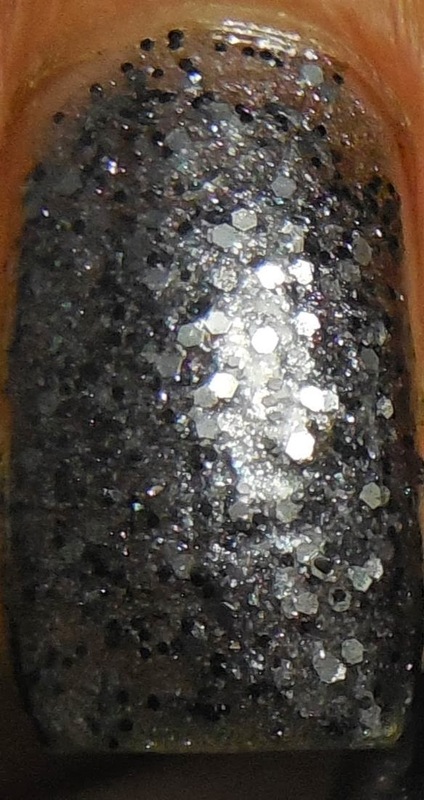 Today's swatch is Feenix Lacquer Ashes, a gunmetal microglitter polish with black and silver hex glitter accents. Although the base is clear, the glitter is dense enough that two coats give fair opacity. I used three layers here, and had a little trouble with the formula in that it was thick and not wanting to flow easily up to the edges of my nail beds. Regretfully, there's a bit of a larger gap than I'm use to. It also wanted to pool towards the tips if I didn't use thin coats. I suppose if I thinned it down a little these issues wouldn't happen. Dry time was a little on the slow side too, and I was more prone to dents than normal for me. I didn't use any topcoat in these pics. For Halloween's sake, I decided to try my hand at some pumpkin nail art on my ring finger. 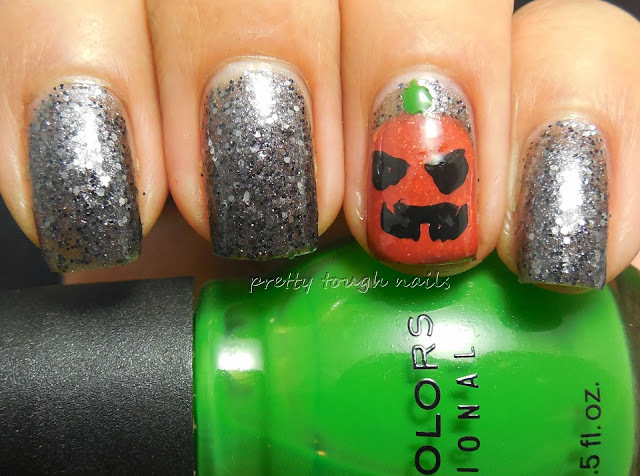 I used Essence Gorgeous Bling Bling for the pumpkin and Sinful Colors Exotic Green for the top. Say hi to my little grumpy pumpkin! I think the Ashes functions well as a night sky glittering backdrop for the pumpkin. Unfortunately at the time of this post, and my sincere apologies in advance, this brand is no longer creating polishes for the general public. I wish I hadn't discovered it so late! Ashes is one of those simple appearing polishes that get more complex as you get closer, which I love. Hopefully one day Feenix will make a comeback. It goes to show, if you don't jump on a nail polish color that you like, you risk the high chance of never seeing it again. I should probably go take a look at my lemming list! 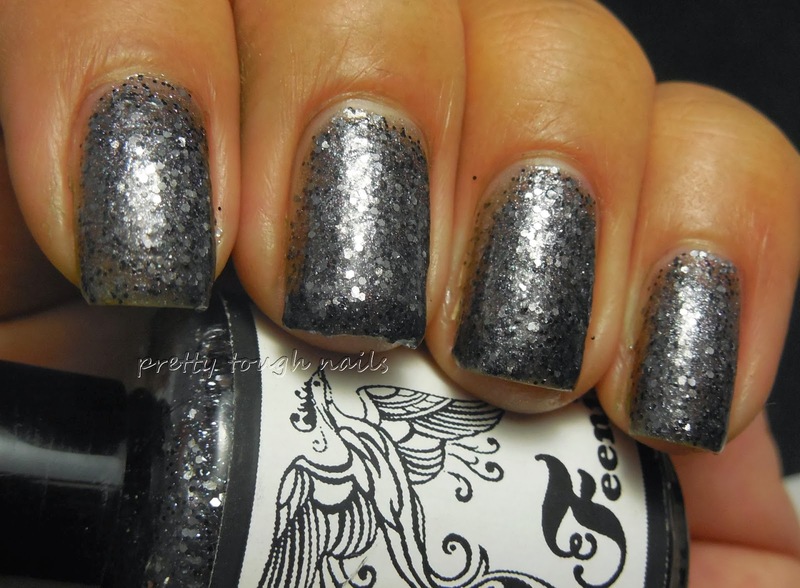 Speaking of catching lemmings before they get away, make sure you enter the Hobby Polish Blogger's giveaway that I'm participating before it ends! That's $320 that could be yours to spend at any nail polish e-tailer of your choice. Good luck! I love this! The glitter is really pretty. The pumpkin is such a cute touch.